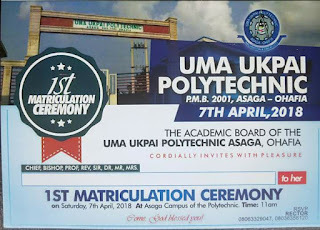 The Uma Ukpai Polytechnic, Asaga-Ohafia Maiden [1st] Matriculation Ceremony for Freshers/Newly Admitted Students, 2017/2018 Academic Session. 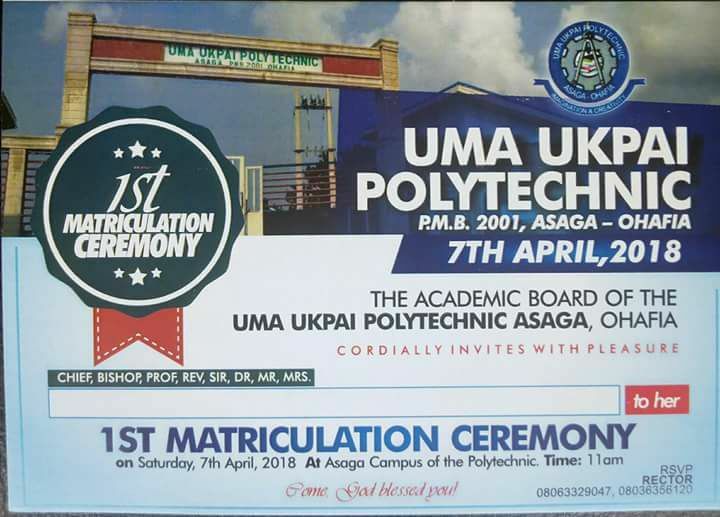 The Academic Board of the Ukpai Polytechnic, Asaga-Ohafia, Abia State Cordially invites the general public to their 1st/maiden matriculation ceremony for the 2017/2018 academic session. All newly admitted students are to endeavor to attend the ceremony as it is a crucial part and a stepping stone of admission into the polytechnic.